HA NOI (VNS) — Becamex Binh Duong became champions of the 2015 Toyota V.League 1 with two matches in hand after a goalless draw with Hai Phong in the 24th round at Lach Tray Stadium on Tuesday. The champions earned 49 points after 24 matches, six points more than their closest rival, FLC Thanh Hoa, who lost 3-4 to Quang Nam. 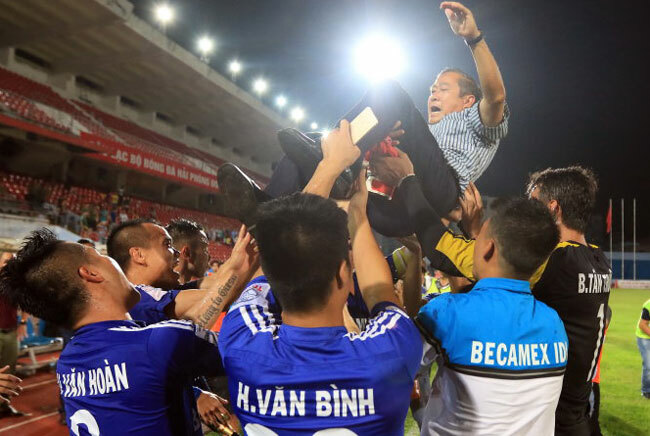 Binh Duong become the first Vietnamese team to win the national premier league for the fourth time. Their previous titles were in 2007, 2008 and 2014. The team will receive a huge bonus of VND10 billion (US$454,000) from V-League organisers and sponsors, a reward that will be handed over to the winner at a celebration. Binh Duong are expected to win a double title this year as they play the National Cup final match against Ha Noi T&T on September 26. If they indeed win, they will receive another bonus of VND3 billion ($136,400). At Pleiku Stadium, Hoang Anh Gia Lai (HAGL) came from behind to beat Ha Noi T&T 3-2. This win helped HAGL nurse better hopes of staying in the national premier league after many losses that had made the team stare at the risk of being relegated to the lesser football event. HAGL have 23 points to be ranked 11th out of 14 teams, leaving behind the bottom-placed team Dong Nai with 18 points. Ha Noi T&T rank third with 40 points. The visitors T&T dominated the match since the first minutes to seek three points. Having received a pass from Pham Thanh Luong, Hoang Vu Samson opened the score for T&T in the 19th minute. Nine minutes later, Nguyen Ngoc Duy coolly put his header past the goalkeeper of HAGL to double the score for the visitors. After two quick losses, HAGL played more aggressively to narrow the gap but failed. After the break, newly appointed coach Nguyen Quoc Tuan, who had chosen to replace French coach Guillaume Graechen, made the team change its tactics, something that succeeded. In the 50th minute, HAGL's Nguyen Cong Phuong passed the ball to his teammate Bui Van Long. A long shot to the penalty area and the ball beat T&T's Gonzalo Damian Marronkle's leg and slowly rolled into the visitors' goal. The mountainous team HAGL scored two more goals in the 64th and 77th minutes, thanks to Nguyen Van Toan and Le Hoang Thien. In other news, Da Nang defeated Dong Thap 4-2 and Can Tho bested Song Lam Nghe An 3-0.